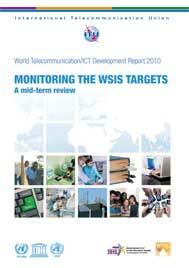 The 9th edition of the ITU World Telecommunication/ICT Development Report (WTDR 2010) focuses on Monitoring the WSIS Targets. The year 2010 marks the midpoint between the 2005 Tunis phase of the World Summit on the Information Society (WSIS) and 2015, the deadline for achieving the ten targets that governments agreed upon at the WSIS. The Report is a mid-term review, and provides policy makers with a comprehensive assessment of what has been achieved so far, and what remains to be done. The Report has been prepared specifically for the WSIS Forum 2010 and the ITU World Telecommunication Development Conference (WTDC-10), both to be held in May 2010. The Report reviews the 10 targets, proposes concrete indicators to monitor them and makes recommendations on policies and measures to help achieve them: To connect villages with ICTs and establish community access points To connect universities, colleges, secondary schools, and primary schools with ICTs To connect scientific and research centers with ICTs To connect public libraries, cultural centers, museums, post offices, and archives with ICTs To connect health centers and hospitals with ICTs To connect all local and central Government departments and establish web sites and e-mail addresses To adapt all primary and secondary school curricula to meet the challenges of the information society, taking into account national circumstances To ensure that all of the world's population has access to television and radio services To encourage the development of content and put in place technical conditions in order to facilitate the presence and use of all world languages on the Internet To ensure that more than half the world's inhabitants have access to ICTs within their reach The Report reflects a joint effort among several international organisations, led by ITU and including contributions from UNESCO, WHO and UNDESA, as well as from representatives of civil society.